For the 2013 film, see Computer Chess (film). Computer chess includes both hardware (dedicated computers) and software capable of playing chess. Computer chess provides opportunities for players to practice even in the absence of human opponents, and also provides opportunities for analysis, entertainment and training. Since around 2005, chess engines have been able to defeat even the strongest human players. Nevertheless, it is considered unlikely that computers will ever solve chess due to its computational complexity. The idea of creating a chess-playing machine dates back to the eighteenth century. Around 1769, the chess playing automaton called The Turk became famous before being exposed as a hoax. Before the development of digital computing, serious trials based on automata such as El Ajedrecista of 1912, were too complex and limited to be useful for playing full games of chess. The field of mechanical chess research languished until the advent of the digital computer in the 1950s. Since then, chess enthusiasts and computer engineers have built, with increasing degrees of seriousness and success, chess-playing machines and computer programs. 1769 – Wolfgang von Kempelen builds the Automaton Chess-Player, in what becomes one of the greatest hoaxes of its period. 1868 – Charles Hooper presented the Ajeeb automaton — which also had a human chess player hidden inside. 1912 – Leonardo Torres y Quevedo builds a machine that could play King and Rook versus King endgames. 1941 – Predating comparable work by at least a decade, Konrad Zuse develops computer chess algorithms in his Plankalkül programming formalism. Because of the circumstances of the Second World War, however, they were not published, and did not come to light, until the 1970s. 1948 – Norbert Wiener's book Cybernetics describes how a chess program could be developed using a depth-limited minimax search with an evaluation function. 1950 – Claude Shannon publishes "Programming a Computer for Playing Chess", one of the first papers on the problem of computer chess. 1951 – Alan Turing is first to publish a program, developed on paper, that was capable of playing a full game of chess (dubbed Turochamp). 1952 – Dietrich Prinz develops a program that solves chess problems. Los Alamos chess. This simplified version of chess was played in 1956 by the MANIAC I computer. 1956 – Los Alamos chess is the first program to play a chess-like game, developed by Paul Stein and Mark Wells for the MANIAC I computer. 1956 – John McCarthy invents the alpha-beta search algorithm. 1957 – The first programs that can play a full game of chess are developed, one by Alex Bernstein and one by Russian programmers using a BESM. 1958 – NSS becomes the first chess program to use the alpha-beta search algorithm. 1962 – The first program to play credibly, Kotok-McCarthy, is published at MIT. 1963 – Grandmaster David Bronstein defeats an M-20 running an early chess program. 1966–67 – The first chess match between computer programs is played. Moscow Institute for Theoretical and Experimental Physics (ITEP) defeats Kotok-McCarthy at Stanford University by telegraph over nine months. 1968 – Scottish chess champion David Levy makes a bet with AI pioneers John McCarthy and Donald Michie that no computer program would win a chess match against him within 10 years. 1970 – Monty Newborn and the Association for Computing Machinery organize the first ACM North American Computer Chess Championships in New York. 1974 – David Levy, Ben Mittman and Monty Newborn organize the first World Computer Chess Championship which is won by the Russian program Kaissa. 1975 – January, Micro Instrumentation and Telemetry Systems (MITS) releases the Altair 8800, the first commercially successful microcomputer. 1976 – In December, Canadian programmer Peter R. Jennings releases Microchess, the first game for microcomputers to be sold. Released in 1977, Boris was one of the first chess computers to be widely marketed. 1977 – In March, Fidelity Electronics releases Chess Challenger coded by Ron Nelson, the first dedicated chess computer to be sold. Chess 4.6 becomes the first chess computer to be successful at a major chess tournament. Ben Mittman founded the International Computer Chess Association. Also that year, Applied Concepts released Boris, a dedicated chess computer in a wooden box with plastic chess pieces and a folding board. 1978 – David Levy wins the bet made 10 years earlier, defeating Chess 4.7 in a six-game match by a score of 4½–1½. The computer's victory in game four is the first defeat of a human master in a tournament. With Levy's help, Personal Computer World magazine organizes the first PCW Microprocessor Championship. Dan and Kathe Spracklen start selling photocopies of the Sargon source code. 1979 – Frederic Friedel organizes a rematch between IM David Levy and Chess 4.7, which is broadcast on German television. 1980 – The third PCW Microcomputer championship is declared the first World Microcomputer Chess Championship. Fidelity computers win the World Microcomputer Championships each year from 1980 through 1984. [better source needed] In Germany, Hegener & Glaser release their first Mephisto dedicated chess computer.The USCF prohibits computers from competing in human tournaments except when represented by the chess systems' creators. The Fredkin Prize is established. 1981 – Cray Blitz wins the Mississippi State Championship with a perfect 5–0 score and a performance rating of 2258. In round 4 it defeats Joe Sentef (2262) to become the first computer to beat a master in tournament play and the first computer to gain a master rating. The World Microcomputer Chess Championship is split into commercial (won by SciSys) and open (won by Fidelity) divisions. In August, IBM releases its first PC, the IBM 5150 running on Intel chips with an operating system designed by Microsoft, a platform that was soon to become the main one for chess programmers. 1982 – Ken Thompson's hardware chess player Belle earns a US master title. David Horne releases 1K ZX Chess, the code of which only takes up 672 bytes, for the Sinclair ZX81. 1983 – Acorn Computers sponsors Garry Kasparov's Candidates match with Viktor Korchnoi. Kasparov wins an Acorn Archimedes as part of his prize, sparking his interest in computers. Frederic Friedel founds the magazine Computer-schach International, changing the name the next year to Computer-schach & Spiele. Richard Lang's Psion becomes one of the first programs to be ported to the IBM PC. Psion would share the World Microcomputer Chess Championship title in 1984. 1984 – January - British GM John Nunn starts annotating games for Personal Computer World magazine. In June, he joins the editorial board of Computer-schach & Spiele magazine. The Svenska schackdatorföreningen (SSDF Swedish Chess Computer Association) is founded, taking over the publication of Ply Magazine, and publishing its first computer chess rating list. The German Company Hegener & Glaser's Mephisto line of dedicated chess computers begins a long streak of victories (1984-1990) in the World Microcomputer Championship using dedicated computers powered by programs by Richard Lang(ChessGenius) and Ed Schröder(Rebel), and offered for sale commercially. Soon after, companies such as Millennium 2000, Scisys/Saitek and The Advanced Software Company (TASC) start producing dedicated chess computers. 1985 – Eric Hallsworth puts out the first issue of Selective Search magazine devoted to computer chess. 1986 – Software Country (see Software Toolworks) released Chessmaster 2000 based on an engine by David Kittinger, the first edition of what was to become the world's best selling line of chess programs. 1987 – Frederic Friedel and physicist Matthias Wüllenweber found Chessbase, releasing the first chess database program. Friedel's friend, world champion Garry Kasparov begins using Chessbase to prep for specific opponents. Stuart Cracraft releases GNU Chess, one of the first 'chess engines' to be bundled with a separate graphical user interface (GUI), chesstool. 1988 – HiTech, developed by Hans Berliner and Carl Ebeling, wins a match against grandmaster Arnold Denker 3½–½. Deep Thought shares first place with Tony Miles in the Software Toolworks Championship, ahead of former world champion Mikhail Tal and several grandmasters including Samuel Reshevsky, Walter Browne and Mikhail Gurevich. It also defeats grandmaster Bent Larsen, making it the first computer to beat a GM in a tournament. Its rating for performance in this tournament of 2745 (USCF scale) was the highest obtained by a computer player. Interplay Entertainment releases Battle Chess, a popular program where the animated pieces fight each other every time a piece is captured. This idea was remade many times, e.g. Empire Interactive's Combat Chess (based on Rebel), XS Games' War Chess, Battle vs. Chess (using Fritz 10), and Interplay's Battle Chess: Game of Kings. 1989 – Deep Thought loses two exhibition games to Garry Kasparov, the reigning world champion. Hegener & Glaser buys out Fidelity Electronics. 1990 – On April 25, former world champion Anatoly Karpov lost in a simul to Hegener & Glaser's Mephisto Portorose 68030 chess computer. 1991 – The ChessMachine based on Ed Schröder's Rebel wins the World Microcomputer Chess Championship, and is offered for sale by the Dutch The Advanced Software Company (TASC). Frans Morsch, the Dutch author of the chess programs Nona and Quest, joins Chessbase, where he designs their Fritz engine, which is released in the U.S. as Knightstalker. 1992 – ChessMachine wins the 7th World Computer Chess Championship, the first time a microcomputer beat mainframes. GM John Nunn releases Secrets of Rook Endings, the first book based on endgame tablebases developed by Ken Thompson. In December, Kasparov visits Frederic Friedel in his hotel room in Cologne, and plays a series of blitz games against Fritz 2 winning 24, drawing 4 and losing 9. 1993 – Deep Blue loses a four-game match against Bent Larsen. Stephen J. Edwards issues the first Portable Game Notation specification, allowing people and programs to share the moves of games. In his book on the Four Knights Defence, GM John Nunn thanks TASC for providing him with a ChessMachine for use in his opening analysis. Nunn also reports receiving phone calls from Frederic Friedel explaining that the Chessbase engine Fritz 2 is busting more published endgame analysis. Chess programs running on personal computers surpass Mephisto's dedicated chess computers to win the Microcomputer Championship, marking a shift from dedicated chess hardware to software on multipurpose personal computers. 1994 – February - John Nunn writes an article for British Chess Magazine asking if Chessbase's Fritz or ChessGenius is stronger. May 19-20, Fritz entered a GM blitz tournament for the first time, the Munich Intel Express. Kasparov lost his first game to Fritz, but managed to tie for first place in the tournament, and then win the playoff, but on the next day, he lost another blitz game to Fritz on ZDF television. In July, Viswanathan Anand plays some opening novelties checked with Fritz in his Candidates match vs. Gata Kamsky. On August 31st, at the London Intel Grand Prix, a rapid, Richard Lang's ChessGenius 2 knocked Kasparov out in the first round, another first. Shay Bushinsky, co-author of Junior, asked Tim Mann how to hook his engine to the GNU Chess Graphical User Interface, and Tim's reply became the basis for the Chess Engine Communication Protocol (a.k.a. Winboard engines). Saitek bought Hegener & Glaser, but continues producing their Mephisto dedicated chess computers. 1995 – May 20, Kasparov gets his revenge on ChessGenius beating it 1 1/2-1/2 in rapid games on Cologne TV. Fritz beats Deep Blue to win the World Computer Chess Championships in Hong Kong. 1996 – Deep Blue loses a six-game match against Garry Kasparov. 1997 – Deep Blue wins a six-game match against Garry Kasparov. Chess programmers move from the rec.games.chess.computer newsgroup to the Computer Chess Club message board. 1999 – Stefan Meyer-Kahlen, author of Shredder, joins Chessbase, where Mathias Feist ports Shredder to the Chessbase format to sell it in the Fritz Graphical User Interface. Shredder started to win many of the world computer, software and microcomputer championships vs. other engines from this point on. 2000 – Stefan Meyer-Kahlen and Rudolf Huber draft the Universal Chess Interface, a protocol for GUIs to talk to engines that would gradually become the main form new engines would take. UCI includes provisions for limiting the strength of engines through its uci_limitstrength and uci_elo parameters giving amateurs a chance to play against the top engines on even terms. 2002 – Vladimir Kramnik draws an eight-game match against Deep Fritz. The International Computer Chess Association changes its name to the International Computer Games Association. 2003 – Kasparov draws a six-game match against Deep Junior. 2003 – Kasparov draws a four-game match against X3D Fritz. 2004 – a team of computers (Hydra, Deep Junior and Fritz), wins 8½–3½ against a rather strong human team formed by Veselin Topalov, Ruslan Ponomariov and Sergey Karjakin, who had an average Elo rating of 2681. In his match with Peter Leko, Vladimir Kramnik employs an opening novelty checked by chess engines, but ends up losing the game. Fabien Letouzey releases the source code for Fruit 2.1, an engine quite competitive with the top closed source engines of the time. This leads many authors to revise their code, incorporating the new ideas. 2005 – Hydra defeats Michael Adams 5½–½. 2005 – Rybka wins the IPCCC tournament and very quickly afterwards becomes the strongest engine. 2006 – the world champion, Vladimir Kramnik, is defeated 4–2 by Deep Fritz. 2007 – GM Larry Christiansen and IM Josh Waitzkin produce audio tutorials for Ubisoft Chessmaster Grandmaster Edition, cementing its popularity. The Computer Chess Club moves to Talkchess.com. 2008 – On the Talkchess.com Forum, Zach Wegner called attention to the similarities between Rybka 1.0 and Fruit 2.1, intimating that Rybka is a Fruit clone. 2009 – Pocket Fritz 4 wins Copa Mercosur 9½/10. A group of pseudonymous Russian programmers release the source code of Ippolit, an engine seemingly stronger than Rybka. This becomes the basis for the engines Robbolito and Ivanhoe, and many engine authors adopt ideas from it. 2010 – Before the World Chess Championship 2010, Topalov prepares by sparring against the supercomputer Blue Gene with 8,192 processors capable of 500 trillion (5 × 1014) floating point operations per second. Rybka developer, Vasik Rajlich accuses Ippolit of being a clone of Rybka. 2011 – Engine programmers Stefan Meyer-Kahlen, Don Dailey, Shay Bushinsky (Junior) and others sign an open letter confirming that they believe Rybka is a clone of Fruit. The ICGA strips Rybka of its WCCC titles. 2015 – BootChess computer implementation of chess at a size of only 487 bytes. 2015 – Super Micro is now the smallest computer implementation of chess on any platform at a size of only 455 bytes. 2017 – A computer engine ends first in the freestyle Ultimate Challenge tournament. The first ranked human plus computer player came in at 3rd place. 2017 – AlphaZero beats Stockfish 28-0, with 72 draws, in a 100-game match. Chess-playing computers and software came onto the market in the mid-1970s. There are many chess engines such as Stockfish, Crafty, Fruit and GNU Chess that can be downloaded from the Internet free of charge. Top programs such as Stockfish have surpassed even world champion caliber players. CEGT, CSS, SSDF, and WBEC maintain rating lists allowing fans to compare the strength of engines. As of 3 February 2016, Stockfish is the top rated chess program on the IPON rating list. CCRL (Computer Chess Rating Lists) is an organisation that tests computer chess engines' strength by playing the programs against each other. CCRL was founded in 2006 by Graham Banks, Ray Banks, Sarah Bird, Kirill Kryukov and Charles Smith, and as of June 2012 its members are Graham Banks, Ray Banks (who only participates in Chess960, or Fischer Random Chess), Shaun Brewer, Adam Hair, Aser Huerga, Kirill Kryukov, Denis Mendoza, Charles Smith and Gabor Szots. The organisation runs three different lists: 40/40 (40 minutes for every 40 moves played), 40/4 (4 minutes for every 40 moves played), and 40/4 FRC (same time control but Chess960). [Note 1] Pondering (or permanent brain) is switched off and timing is adjusted to the AMD64 X2 4600+ (2.4 GHz) CPU by using Crafty 19.17 BH as a benchmark. Generic, neutral opening books are used (as opposed to the engine's own book) up to a limit of 12 moves into the game alongside 4 or 5 man tablebases. Using "ends-and-means" heuristics a human chess player can intuitively determine optimal outcomes and how to achieve them regardless of the number of moves necessary, but a computer must be systematic in its analysis. Most players agree that looking at least five moves ahead (ten plies) when necessary is required to play well. Normal tournament rules give each player an average of three minutes per move. On average there are more than 30 legal moves per chess position, so a computer must examine a quadrillion possibilities to look ahead ten plies (five full moves); one that could examine a million positions a second would require more than 30 years. After discovering refutation screening—the application of alpha-beta pruning to optimizing move evaluation—in 1957, a team at Carnegie Mellon University predicted that a computer would defeat the world human champion by 1967. It did not anticipate the difficulty of determining the right order to evaluate branches. Researchers worked to improve programs' ability to identify killer heuristics, unusually high-scoring moves to reexamine when evaluating other branches, but into the 1970s most top chess players believed that computers would not soon be able to play at a Master level. In 1968 International Master David Levy made a famous bet that no chess computer would be able to beat him within ten years, and in 1976 Senior Master and professor of psychology Eliot Hearst of Indiana University wrote that "the only way a current computer program could ever win a single game against a master player would be for the master, perhaps in a drunken stupor while playing 50 games simultaneously, to commit some once-in-a-year blunder". In the late 1970s chess programs suddenly began defeating top human players. The year of Hearst's statement, Northwestern University's Chess 4.5 at the Paul Masson American Chess Championship's Class B level became the first to win a human tournament. Levy won his bet in 1978 by beating Chess 4.7, but it achieved the first computer victory against a Master-class player at the tournament level by winning one of the six games. In 1980 Belle began often defeating Masters. By 1982 two programs played at Master level and three were slightly weaker. The sudden improvement without a theoretical breakthrough surprised humans, who did not expect that Belle's ability to examine 100,000 positions a second—about eight plies—would be sufficient. The Spracklens, creators of the successful microcomputer program Sargon, estimated that 90% of the improvement came from faster evaluation speed and only 10% from improved evaluations. New Scientist stated in 1982 that computers "play terrible chess ... clumsy, inefficient, diffuse, and just plain ugly", but humans lost to them by making "horrible blunders, astonishing lapses, incomprehensible oversights, gross miscalculations, and the like" much more often than they realized; "in short, computers win primarily through their ability to find and exploit miscalculations in human initiatives". By 1982, microcomputer chess programs could evaluate up to 1,500 moves a second and were as strong as mainframe chess programs of five years earlier, able to defeat almost all players. While only able to look ahead one or two plies more than at their debut in the mid-1970s, doing so improved their play more than experts expected; seemingly minor improvements "appear to have allowed the crossing of a psychological threshold, after which a rich harvest of human error becomes accessible", New Scientist wrote. While reviewing SPOC in 1984, BYTE wrote that "Computers—mainframes, minis, and micros—tend to play ugly, inelegant chess", but noted Robert Byrne's statement that "tactically they are freer from error than the average human player". The magazine described SPOC as a "state-of-the-art chess program" for the IBM PC with a "surprisingly high" level of play, and estimated its USCF rating as 1700 (Class B). At the 1982 North American Computer Chess Championship, Monroe Newborn predicted that a chess program could become world champion within five years; tournament director and International Master Michael Valvo predicted ten years; the Spracklens predicted 15; Ken Thompson predicted more than 20; and others predicted that it would never happen. The most widely held opinion, however, stated that it would occur around the year 2000. In 1989, Levy was defeated by Deep Thought in an exhibition match. Deep Thought, however, was still considerably below World Championship Level, as the then reigning world champion Garry Kasparov demonstrated in two strong wins in 1989. It was not until a 1996 match with IBM's Deep Blue that Kasparov lost his first game to a computer at tournament time controls in Deep Blue - Kasparov, 1996, Game 1. This game was, in fact, the first time a reigning world champion had lost to a computer using regular time controls. However, Kasparov regrouped to win three and draw two of the remaining five games of the match, for a convincing victory. In May 1997, an updated version of Deep Blue defeated Kasparov 3½–2½ in a return match. A documentary mainly about the confrontation was made in 2003, titled Game Over: Kasparov and the Machine. IBM keeps a web site of the event. With increasing processing power and improved evaluation functions, chess programs running on commercially available workstations began to rival top flight players. In 1998, Rebel 10 defeated Viswanathan Anand, who at the time was ranked second in the world, by a score of 5–3. However most of those games were not played at normal time controls. Out of the eight games, four were blitz games (five minutes plus five seconds Fischer delay (see time control) for each move); these Rebel won 3–1. Two were semi-blitz games (fifteen minutes for each side) that Rebel won as well (1½–½). Finally, two games were played as regular tournament games (forty moves in two hours, one hour sudden death); here it was Anand who won ½–1½. In fast games, computers played better than humans, but at classical time controls – at which a player's rating is determined – the advantage was not so clear. In the early 2000s, commercially available programs such as Junior and Fritz were able to draw matches against former world champion Garry Kasparov and classical world champion Vladimir Kramnik. In October 2002, Vladimir Kramnik and Deep Fritz competed in the eight-game Brains in Bahrain match, which ended in a draw. Kramnik won games 2 and 3 by "conventional" anti-computer tactics – play conservatively for a long-term advantage the computer is not able to see in its game tree search. Fritz, however, won game 5 after a severe blunder by Kramnik. Game 6 was described by the tournament commentators as "spectacular." Kramnik, in a better position in the early middlegame, tried a piece sacrifice to achieve a strong tactical attack, a strategy known to be highly risky against computers who are at their strongest defending against such attacks. True to form, Fritz found a watertight defense and Kramnik's attack petered out leaving him in a bad position. Kramnik resigned the game, believing the position lost. However, post-game human and computer analysis has shown that the Fritz program was unlikely to have been able to force a win and Kramnik effectively sacrificed a drawn position. The final two games were draws. Given the circumstances, most commentators still rate Kramnik the stronger player in the match. In January 2003, Garry Kasparov played Junior, another chess computer program, in New York City. The match ended 3–3. In November 2003, Garry Kasparov played X3D Fritz. The match ended 2–2. In 2005, Hydra, a dedicated chess computer with custom hardware and sixty-four processors and also winner of the 14th IPCCC in 2005, defeated seventh-ranked Michael Adams 5½–½ in a six-game match (though Adams' preparation was far less thorough than Kramnik's for the 2002 series). In November–December 2006, World Champion Vladimir Kramnik played Deep Fritz. This time the computer won; the match ended 2–4. Kramnik was able to view the computer's opening book. In the first five games Kramnik steered the game into a typical "anti-computer" positional contest. He lost one game (overlooking a mate in one), and drew the next four. In the final game, in an attempt to draw the match, Kramnik played the more aggressive Sicilian Defence and was crushed. There was speculation that interest in human-computer chess competition would plummet as a result of the 2006 Kramnik-Deep Fritz match. According to Newborn, for example, "the science is done". Human-computer chess matches showed the best computer systems overtaking human chess champions in the late 1990s. For the 40 years prior to that, the trend had been that the best machines gained about 40 points per year in the Elo rating while the best humans only gained roughly 2 points per year. The highest rating obtained by a computer in human competition was Deep Thought's USCF rating of 2551 in 1988 and FIDE no longer accepts human-computer results in their rating lists. Specialized machine-only Elo pools have been created for rating machines, but such numbers, while similar in appearance, should not be directly compared. In 2016, the Swedish Chess Computer Association rated computer program Komodo at 3361. Chess engines continue to improve. In 2009, chess engines running on slower hardware have reached the grandmaster level. A mobile phone won a category 6 tournament with a performance rating 2898: chess engine Hiarcs 13 running inside Pocket Fritz 4 on the mobile phone HTC Touch HD won the Copa Mercosur tournament in Buenos Aires, Argentina with 9 wins and 1 draw on August 4–14, 2009. Pocket Fritz 4 searches fewer than 20,000 positions per second. This is in contrast to supercomputers such as Deep Blue that searched 200 million positions per second. Advanced Chess is a form of chess developed in 1998 by Kasparov where a human plays against another human, and both have access to computers to enhance their strength. The resulting "advanced" player was argued by Kasparov to be stronger than a human or computer alone, this has been proven in numerous occasions, at Freestyle Chess events. In 2017, a win by a computer engine in the freestyle Ultimate Challenge tournament was the source of a lengthy debate, in which the organisers declined to participate. Players today are inclined to treat chess engines as analysis tools rather than opponents. Leaf evaluation – how to evaluate the value of a board position, if no further search will be done from that position. Computer chess programs usually support a number of common de facto standards. Nearly all of today's programs can read and write game moves as Portable Game Notation (PGN), and can read and write individual positions as Forsyth–Edwards Notation (FEN). Older chess programs often only understood long algebraic notation, but today users expect chess programs to understand standard algebraic chess notation. Developers have to decide whether to connect the engine to an opening book and/or endgame tablebases or leave this to the GUI. The data structure used to represent each chess position is key to the performance of move generation and position evaluation. Methods include pieces stored in an array ("mailbox" and "0x88"), piece positions stored in a list ("piece list"), collections of bit-sets for piece locations ("bitboards"), and huffman coded positions for compact long-term storage. The first paper on the subject was by Claude Shannon in 1950. He predicted the two main possible search strategies which would be used, which he labeled "Type A" and "Type B", before anyone had programmed a computer to play chess. Type A programs would use a "brute force" approach, examining every possible position for a fixed number of moves using the minimax algorithm. Shannon believed this would be impractical for two reasons. Second, it ignored the problem of quiescence, trying to only evaluate a position that is at the end of an exchange of pieces or other important sequence of moves ('lines'). He expected that adapting type A to cope with this would greatly increase the number of positions needing to be looked at and slow the program down still further. Only look at a few good moves for each position. This would enable them to look further ahead ('deeper') at the most significant lines in a reasonable time. The test of time has borne out the first approach; all modern programs employ a terminal quiescence search before evaluating positions. The second approach (now called forward pruning) has been dropped in favor of search extensions. Adriaan de Groot interviewed a number of chess players of varying strengths, and concluded that both masters and beginners look at around forty to fifty positions before deciding which move to play. What makes the former much better players is that they use pattern recognition skills built from experience. This enables them to examine some lines in much greater depth than others by simply not considering moves they can assume to be poor. More evidence for this being the case is the way that good human players find it much easier to recall positions from genuine chess games, breaking them down into a small number of recognizable sub-positions, rather than completely random arrangements of the same pieces. In contrast, poor players have the same level of recall for both. The problem with type B is that it relies on the program being able to decide which moves are good enough to be worthy of consideration ('plausible') in any given position and this proved to be a much harder problem to solve than speeding up type A searches with superior hardware and search extension techniques. One of the few chess grandmasters to devote himself seriously to computer chess was former World Chess Champion Mikhail Botvinnik, who wrote several works on the subject. He also held a doctorate in electrical engineering. Working with relatively primitive hardware available in the Soviet Union in the early 1960s, Botvinnik had no choice but to investigate software move selection techniques; at the time only the most powerful computers could achieve much beyond a three-ply full-width search, and Botvinnik had no such machines. In 1965 Botvinnik was a consultant to the ITEP team in a US-Soviet computer chess match (see Kotok-McCarthy). One developmental milestone occurred when the team from Northwestern University, which was responsible for the Chess series of programs and won the first three ACM Computer Chess Championships (1970–72), abandoned type B searching in 1973. The resulting program, Chess 4.0, won that year's championship and its successors went on to come in second in both the 1974 ACM Championship and that year's inaugural World Computer Chess Championship, before winning the ACM Championship again in 1975, 1976 and 1977. One reason they gave for the switch was that they found it less stressful during competition, because it was difficult to anticipate which moves their type B programs would play, and why. They also reported that type A was much easier to debug in the four months they had available and turned out to be just as fast: in the time it used to take to decide which moves were worthy of being searched, it was possible just to search all of them. Furthermore, technological advances by orders of magnitude in processing power have made the brute force approach far more incisive than was the case in the early years. The result is that a very solid, tactical AI player aided by some limited positional knowledge built in by the evaluation function and pruning/extension rules began to match the best players in the world. It turned out to produce excellent results, at least in the field of chess, to let computers do what they do best (calculate) rather than coax them into imitating human thought processes and knowledge. In 1997 Deep Blue defeated World Champion Garry Kasparov, marking the first time a computer has defeated a reigning world chess champion in standard time control. Computer chess programs consider chess moves as a game tree. In theory, they examine all moves, then all counter-moves to those moves, then all moves countering them, and so on, where each individual move by one player is called a "ply". This evaluation continues until a certain maximum search depth or the program determines that a final "leaf" position has been reached (e.g. checkmate). A naive implementation of this approach can only search to a small depth in a practical amount of time, so various methods have been devised to greatly speed the search for good moves. The AlphaZero program uses a variant of Monte Carlo tree search without rollout. For most chess positions, computers cannot look ahead to all possible final positions. Instead, they must look ahead a few plies and compare the possible positions, known as leaves. The algorithm that evaluates leaves is termed the "evaluation function", and these algorithms are often vastly different between different chess programs. Evaluation functions typically evaluate positions in hundredths of a pawn (called a centipawn), and consider material value along with other factors affecting the strength of each side. 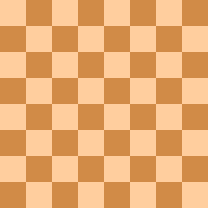 When counting up the material for each side, typical values for pieces are 1 point for a pawn, 3 points for a knight or bishop, 5 points for a rook, and 9 points for a queen. (See Chess piece relative value.) The king is sometimes given an arbitrary high value such as 200 points (Shannon's paper) or 1,000,000,000 points (1961 USSR program) to ensure that a checkmate outweighs all other factors (Levy & Newborn 1991:45). By convention, a positive evaluation favors White, and a negative evaluation favors Black. In addition to points for pieces, most evaluation functions take many factors into account, such as pawn structure, the fact that a pair of bishops are usually worth more, centralized pieces are worth more, and so on. The protection of kings is usually considered, as well as the phase of the game (opening, middle or endgame). Endgame play had long been one of the great weaknesses of chess programs, because of the depth of search needed. Some otherwise master-level programs were unable to win in positions where even intermediate human players can force a win. To solve this problem, computers have been used to analyze some chess endgame positions completely, starting with king and pawn against king. Such endgame tablebases are generated in advance using a form of retrograde analysis, starting with positions where the final result is known (e.g., where one side has been mated) and seeing which other positions are one move away from them, then which are one move from those, etc. Ken Thompson was a pioneer in this area. The results of the computer analysis sometimes surprised people. In 1977 Thompson's Belle chess machine used the endgame tablebase for a king and rook against king and queen and was able to draw that theoretically lost ending against several masters (see Philidor position#Queen versus rook). This was despite not following the usual strategy to delay defeat by keeping the defending king and rook close together for as long as possible. Asked to explain the reasons behind some of the program's moves, Thompson was unable to do so beyond saying the program's database simply returned the best moves. Most grandmasters declined to play against the computer in the queen versus rook endgame, but Walter Browne accepted the challenge. A queen versus rook position was set up in which the queen can win in thirty moves, with perfect play. Browne was allowed 2½ hours to play fifty moves, otherwise a draw would be claimed under the fifty-move rule. After forty-five moves, Browne agreed to a draw, being unable to force checkmate or win the rook within the next five moves. In the final position, Browne was still seventeen moves away from checkmate, but not quite that far away from winning the rook. Browne studied the endgame, and played the computer again a week later in a different position in which the queen can win in thirty moves. This time, he captured the rook on the fiftieth move, giving him a winning position (Levy & Newborn 1991:144–48), (Nunn 2002:49). Other positions, long believed to be won, turned out to take more moves against perfect play to actually win than were allowed by chess's fifty-move rule. As a consequence, for some years the official FIDE rules of chess were changed to extend the number of moves allowed in these endings. After a while, the rule reverted to fifty moves in all positions — more such positions were discovered, complicating the rule still further, and it made no difference in human play, as they could not play the positions perfectly. Over the years, other endgame database formats have been released including the Edward Tablebase, the De Koning Database and the Nalimov Tablebase which is used by many chess programs such as Rybka, Shredder and Fritz. Tablebases for all positions with six pieces are available. Some seven-piece endgames have been analyzed by Marc Bourzutschky and Yakov Konoval. Programmers using the Lomonosov supercomputers in Moscow have completed a chess tablebase for all endgames with seven pieces or fewer (trivial endgame positions are excluded, such as six white pieces versus a lone black king). In all of these endgame databases it is assumed that castling is no longer possible. Many tablebases do not consider the fifty-move rule, under which a game where fifty moves pass without a capture or pawn move can be claimed to be a draw by either player. This results in the tablebase returning results such as "Forced mate in sixty-six moves" in some positions which would actually be drawn because of the fifty-move rule. One reason for this is that if the rules of chess were to be changed once more, giving more time to win such positions, it will not be necessary to regenerate all the tablebases. It is also very easy for the program using the tablebases to notice and take account of this 'feature' and in any case if using an endgame tablebase will choose the move that leads to the quickest win (even if it would fall foul of the fifty-move rule with perfect play). If playing an opponent not using a tablebase, such a choice will give good chances of winning within fifty moves. The Nalimov tablebases, which use state-of-the-art compression techniques, require 7.05 GB of hard disk space for all five-piece endings. To cover all the six-piece endings requires approximately 1.2 TB. It is estimated that a seven-piece tablebase requires between 50 and 200 TB of storage space. Endgame databases featured prominently in 1999, when Kasparov played an exhibition match on the Internet against the rest of the world. A seven piece Queen and pawn endgame was reached with the World Team fighting to salvage a draw. Eugene Nalimov helped by generating the six piece ending tablebase where both sides had two Queens which was used heavily to aid analysis by both sides. Many other optimizations can be used to make chess-playing programs stronger. For example, transposition tables are used to record positions that have been previously evaluated, to save recalculation of them. Refutation tables record key moves that "refute" what appears to be a good move; these are typically tried first in variant positions (since a move that refutes one position is likely to refute another). Opening books aid computer programs by giving common openings that are considered good play (and good ways to counter poor openings). Many chess engines use pondering to increase their strength. Of course, faster hardware and additional processors can improve chess-playing program abilities, and some systems (such as Deep Blue) use specialized chess hardware instead of only software. Another way to examine more chess positions is to distribute the analysis of positions to many computers. The ChessBrain project was a chess program that distributed the search tree computation through the Internet. In 2004 the ChessBrain played chess using 2,070 computers. It has been estimated that doubling the computer speed gains approximately fifty to seventy Elo points in playing strength (Levy & Newborn 1991:192). Chess engines have been developed to play some chess variants such as Capablanca Chess, but the engines are almost never directly integrated with specific hardware. Even for the software that has been developed, most will not play chess beyond a certain board size, so games played on an unbounded chessboard (infinite chess) remain virtually untouched by both chess computers and software. These chess playing systems include custom hardware or run on supercomputers. Jonny, won the 2015 WCCC running on a Linux cluster at the University of Bayreuth using 2,400 AMD cores. In the 1980s and early 1990s, there was a competitive market for dedicated chess computers. This market changed in the mid-90s when computers with dedicated processors could no longer compete with the fast processors in personal computers. Nowadays, most dedicated units sold are of beginner and intermediate strength. Chess Challenger, a line of chess computers sold by Fidelity Electronics from 1977 to 1992. These models won the first four World Microcomputer Chess Championships. "The King", which later became the Chessmaster engine, was also used in the TASC R30 dedicated computer. Gideon, a version of Rebel, in 1992 became the first microcomputer to win the World Computer Chess Championship. Excalibur Electronics sells a line of beginner strength units. Mephisto, a line of chess computers sold by Hegener & Glaser. The units won six consecutive World Microcomputer Chess Championships. Novag sold a line of tactically strong computers, including the Constellation, Sapphire, and Star Diamond brands. Phoenix Chess Systems makes limited edition units based around StrongARM and XScale processors running modern engines and emulating classic engines. Saitek sells mid-range units of intermediate strength. They bought out Hegener & Glaser and its Mephisto brand in 1994. Recently, some hobbyists have been using the Multi Emulator Super System to run the chess programs created for Fidelity or Hegener & Glaser's Mephisto computers on modern 64 bit operating systems such as Windows 10. The author of Rebel, Ed Schröder has also adapted three of the Hegener & Glaser Mephisto's he wrote to work as UCI engines. Microchess was the first commercial game for a personal computer, developed first for the KIM-1 and later Commodore PET, Apple II, TRS-80 and others. Bobby Fischer played against MicroChess. Perhaps the most common type of chess software are programs that simply play chess. You make a move on the board, and the AI calculates and plays a response, and back and forth until one player resigns. Sometimes the chess engine, which calculates the moves, and the graphical user interface(GUI) are separate programs. A variety of engines can be imported into the GUI, so that you can play against different styles. Engines often have just a simple text command-line interface while GUIs may offer a variety of piece sets, board styles or even 3D or animated pieces. Because recent engines are so strong, engines or GUIs may offer some way of limiting the engine's strength, so the player has a better chance of winning. Universal Chess Interface(UCI) engines such Fritz or Rybka may have a built in mechanism for reducing the Elo rating of the engine (via UCI's uci_limitstrength and uci_elo parameters). Some versions of Fritz have a Handicap and Fun mode for limiting the current engine or changing the percentage of mistakes it makes or changing its style. Fritz also has a Friend Mode where during the game it tries to match the level of the player. Chess databases allow users to search through a large library of historical games, analyze them, check statistics, and draw up an opening repertoire. Chessbase (for PC) is perhaps the most common program for this amongst professional players, but there are alternatives such as Shane's Chess Information Database (Scid)  for Windows, Mac or Linux, Chess Assistant for PC, Gerhard Kalab's Chess PGN Master for Android or Giordano Vicoli's Chess-Studio for iOS. Programs such as Playchess allow you to play games against other players over the internet. Chess training programs teach chess. Chessmaster had playthrough tutorials by IM Josh Waitzkin and GM Larry Christiansen. Stefan Meyer-Kahlen offers Shredder Chess Tutor based on the Step coursebooks of Rob Brunia and Cor Van Wijgerden. World champions Magnus Carlsen's Play Magnus company recently released a Magnus Trainer app for Android and iOS. Chessbase has Fritz and Chesster for children. Convekta has a large number of training apps such as CT-ART and its Chess King line based on tutorials by GM Alexander Kalinin and Maxim Blokh. There is also Software for handling chess problems. The prospects of completely solving chess are generally considered to be rather remote. It is widely conjectured that there is no computationally inexpensive method to solve chess even in the very weak sense of determining with certainty the value of the initial position, and hence the idea of solving chess in the stronger sense of obtaining a practically usable description of a strategy for perfect play for either side seems unrealistic today. However, it has not been proven that no computationally cheap way of determining the best move in a chess position exists, nor even that a traditional alpha-beta-searcher running on present-day computing hardware could not solve the initial position in an acceptable amount of time. The difficulty in proving the latter lies in the fact that, while the number of board positions that could happen in the course of a chess game is huge (on the order of at least 1043 to 1047), it is hard to rule out with mathematical certainty the possibility that the initial position allows either side to force a mate or a threefold repetition after relatively few moves, in which case the search tree might encompass only a very small subset of the set of possible positions. It has been mathematically proven that generalized chess (chess played with an arbitrarily large number of pieces on an arbitrarily large chessboard) is EXPTIME-complete, meaning that determining the winning side in an arbitrary position of generalized chess provably takes exponential time in the worst case; however, this theoretical result gives no lower bound on the amount of work required to solve ordinary 8x8 chess. Gardner's Minichess, played on a 5×5 board with approximately 1018 possible board positions, has been solved; its game-theoretic value is 1/2 (i.e. a draw can be forced by either side), and the forcing strategy to achieve that result has been described. Progress has also been made from the other side: as of 2012, all 7 and fewer piece (2 kings and up to 5 other pieces) endgames have been solved. A "chess engine" is software that calculates and orders which moves are the strongest to play in a given position. Engine authors focus on improving the play of their engines, often just importing the engine into a graphical user interface(GUI) developed by someone else. Engines communicate with the GUI by following standardized protocols such as the Universal Chess Interface developed by Stefan Meyer-Kahlen and Franz Huber or the Chess Engine Communication Protocol developed by Tim Mann for GNU Chess and Winboard. Chessbase has its own proprietary protocol, and at one time Millennium 2000 had another protocol used for ChessGenius. Engines designed for one operating system and protocol may be ported to other OS's or protocols. In 1997, the Internet Chess Club released its first Java client for playing chess online against other people inside one's webbrowser. This was probably one of the first chess web apps. Free Internet Chess Server followed soon after with a similar client. In 2004, International Correspondence Chess Federation opened up a web server to replace their email based system. Chess.com started offering Live Chess in 2007. Chessbase/Playchess had long had a downloadable client, but they had a web interface by 2013. Another popular web app is tactics training. The now defunct Chess Tactics Server opened its site in 2006, followed by Chesstempo the next year, and Chess.com added its Tactics Trainer in 2008. Chessbase added a tactics trainer web app in 2015. Chessbase took their chess game database online in 1998. Another early chess game databases was Chess Lab, which started in 1999. New In Chess had initially tried to compete with Chessbase by releasing a NICBase program for Windows 3.x, but eventually, decided to give up on software, and instead focus on their online database starting in 2002. One could play against the engine Shredder online from 2006. In 2015, Chessbase added a play Fritz web app, as well as My Games for storing one's games. Starting in 2007, Chess.com offered the content of the training program, Chess Mentor, to their customers online. Top GMs such as Sam Shankland and Walter Browne have contributed lessons. ^ The first number refers to the number of moves which must be made by each engine, the second number refers to the number of minutes allocated to make all of these moves. The repeating time control means that the time is reset after each multiple of this number of moves is reached. For example, in a 40/4 time control, each engine would have 4 minutes to make 40 moves, then a new 4 minutes would be allocated for the next 40 moves and so on, until the game was complete. ^ Chess, a subsection of chapter 25, Digital Computers Applied to Games, of Faster than Thought, ed. B. V. Bowden, Pitman, London (1953). Online. ^ a b c Douglas, J R (December 1978). "Chess 4.7 versus David Levy". BYTE. p. 84. Retrieved 17 October 2013. ^ "New Restrictions". BYTE. January 1981. p. 292. Retrieved 18 October 2013. ^ Horne, David (February 1983). "Full ZX-81 Chess in 1K". Your Computer. pp. 100–102. Retrieved 17 October 2013. ^ Nunn, John (February 1994). "Fritz or Genius?". British Chess Magazine. 114: 91. He also mentions using both in John Nunn. 1995. Nunn's Best Games. Batsford. ^ Garry Kasparov, Jon Speelman and Bob Wade. 1995. Garry Kasparov's Fighting Chess. Henry Holt. p.291. "ChessGenius vs. Kasparov". Ed Schröder. 13 August 2012. ^ Evgeny Bareev and Ilya Levitov. 2007. From London to Elista: The Inside Story of the World Chess Championship Matches that Vladimir Kramnik Won Against Garry Kasparov, Peter Leko, and Veselin Topalov. New In Chess. ^ a b "Pocket Fritz 4 wins Copa Mercosur". Chess.co.uk. Archived from the original on 2011-09-30. Retrieved 2010-04-03. ^ "Challenger uses supercomputer at the world chess championship". Chessbase. ^ Riis, Dr. Søren (2 January 2012). "A Gross Miscarriage of Justice in Computer Chess (part one)". Chessbase News. Retrieved 19 February 2012. ^ "Smallest ever chess program: 487 bytes". Mybroadband.co.za. 28 January 2015. Retrieved 24 September 2016. ^ ""World's Smallest Chess Code" is a Cheating Novice (But Still Kind of Lovable)". DailyTech. Retrieved 24 September 2016. ^ "Super Micro Chess Engine – Home Page – Extremely Compact C Source and Executable Program Size". Smmax.sourceforge.net. Retrieved 24 September 2016. ^ a b Nickel, Arno. "Zor Winner in an Exciting Photo Finish". Infinity Chess. Innovative Solutions. Retrieved 20 April 2018. ^ "IPON-Rating-List". Inwoba.de. Retrieved 1 December 2014. ^ a b c d e f g Hapgood, Fred (23–30 December 1982). "Computer chess bad-human chess worse". New Scientist. pp. 827–830. Retrieved 22 January 2015. ^ Simon, H.A. ; Newell, A. (1958). "Heuristic problem solving: The next advance in operations research" (PDF). Operations Research. 6 (1): 7. doi:10.1287/opre.6.1.1. Retrieved 10 February 2018. ^ Flock, Emil; Silverman, Jonathan (March 1984). "SPOC / The Chess Master". BYTE. pp. 288–294. Retrieved 8 September 2015. ^ Stinson, Craig (Jan 1982). "Chess Championship: Machines Play, People Watch". Softline. p. 6. Retrieved 13 July 2014. ^ "Rebel vs Anand". Rebel.nl. Retrieved 2010-04-03. ^ "Chess News – Adams vs Hydra: Man 0.5 – Machine 5.5". ChessBase.com. Retrieved 2010-04-03. ^ "Once Again, Machine Beats Human Champion at Chess". The New York Times. 5 December 2006. Retrieved 30 April 2010. ^ Stanislav Tsukrov, Pocket Fritz author. Pocket Fritz 4 searches less than 20,000 positions per second. ^ "World chess champion Magnus Carlsen: 'The computer never has been an opponent'". Deutsche Welle. 16 April 2016. Retrieved 26 August 2016. ^ Wheland, Norman D. (October 1978). "A Computer Chess Tutorial". BYTE. p. 168. Retrieved 17 October 2013. ^ Kirill Kryukov. "Endgame Tablebases Online". Kirill-kryukov.com. Retrieved 2010-04-03. ^ "Open chess diary 301–320". Xs4all.nl. Retrieved 2010-04-03. ^ "ChessBrain project". Chessbrain.net. Retrieved 2010-04-03. ^ Sousa, Ismenio. "Fidelity Chess Challenger 1 - World's First Chess Computer". Retrieved 25 September 2016. ^ "Microchess". Retrieved 25 September 2016. ^ "Dr. Robert Hyatt's home page". Cis.uab.edu. 2004-02-01. Retrieved 2010-04-03. ^ The size of the state space and game tree for chess were first estimated in Claude Shannon (1950), "Programming a Computer for Playing Chess" (PDF), Philosophical Magazine, 41 (314), archived from the original (PDF) on 15 March 2010, retrieved 30 December 2008 Shannon gave estimates of 1043 and 10120 respectively, smaller than the estimates in the Game complexity table, which are from Victor Allis's thesis. See Shannon number for details. Lasar, Matthew (2011). Brute force or intelligence? The slow rise of computer chess". Ars Technica. Newborn, Monty (1996). Outsearching Kasparov, American Mathematical Society's Proceeding of Symposia in Applied Mathematics: Mathematical Aspects of Artificial Intelligence, v. 55, pp 175–205, 1998. Based on paper presented at the 1996 Winter Meeting of the AMS, Orlando, Florida, Jan 9–11, 1996. Newborn, Monty (2000). Deep Blue's contribution to AI, Annals of Mathematics and Artificial Intelligence, v. 28, pp. 27–30, 2000. Look up computer chess in Wiktionary, the free dictionary. Wikimedia Commons has media related to Chess computers.